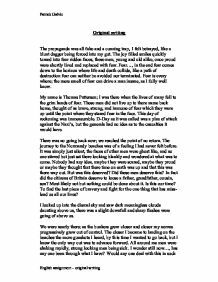 Original writing The propaganda was all fake and a cunning trap, I felt betrayed, like a blunt dagger being forced into my gut. The joy filled smiles quickly turned into fear ridden faces, these men, young and old alike, once proud were shortly lived and replaced with fear. Fear..., in the end fear comes down to the horizon where life and death collide, like a path of destruction fear can neither be avoided nor terminated. Fear is every where; the mere smell of fear can drive a man insane, as I fully well know. My name is Thomas Patterson; I was there when the lives of many fell to the grim hands of fear. These men did not live up to there name back home, thought of as brave, strong, and immune of fear which they were up until the point where they stared fear in the face. This day of reckoning was immeasurable. D-Day as it was called was a plan of attack against the Nazi's, but the generals had no idea as to the casualties it would have. There was no going back now; we reached the point of no return. ...read more. Not only the nerves were going out of control but the stomach as well, rations were limited and so concentration was not at its best. Bombs were shattering the waters surface at all angles, the screaming noise of the German dive bombers coming down was a most unpleasant feeling - time stopped and everybody and everything for that matter fell motionless. No one would stir......waiting......waiting for the crushing pain which would see them out of this mess or the pain of it not being them and having to endure the horrors which the new faced them. Moments later my comrades and I came into view of two large figures gazing upon us like the weaklings which we felt. The breaches upon the beach were huge in size, our job was to get past these but we knew this would no be an easy task. All I could think of was memory's back home and whether or not I would be able to relive these moments again. A few boats had already come and gone which is where all the carnage on the beach came from. Upon the beaches we saw mass amount of body parts hanging here and there, blood stained the sea and beach making it look like a day of reckoning and carnage, which is what it turned out to be. ...read more. My wife....words cannot describe how I am feeling now as to not being able to see her again, the love I own for her is beyond my reach and is uncontrollable. "4" "3" "2" But why am I being so pessimistic..... Along with other fellow soldiers we will all be able to see our loved ones again, teamwork is the key and I understand that without the help of others we can unlock the door. The amount of adrenalin rushing through me now was like the sheer joy of your first offspring seeing the first light of day. I looked at my fellow team mates and could tell they were nervous so I thought to myself; they could do with a bit of encouragement along with a few words of wisdom. "Teamwork" As soon as I said this silence was all around me, know one spoke but looked blankly at me "teamwork is what we need, if we can all work together then we will be able to get out of this place and see our loved ones whom I know you all of you wish to see." 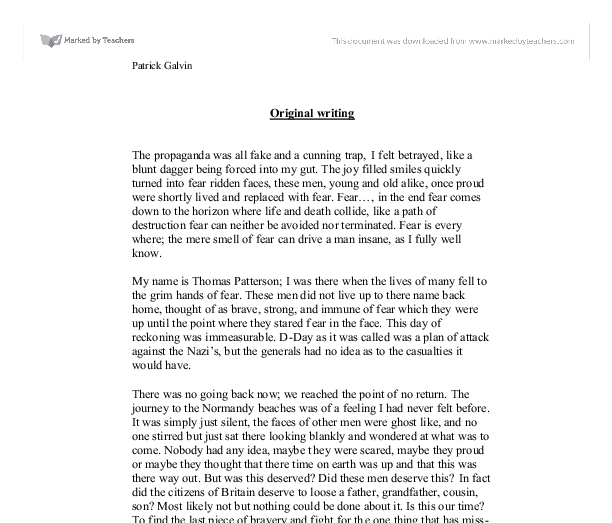 Patrick Galvin English assignment - original writing ...read more. It was time to leave, I knew it. I moved around slightly, as if bidding goodbye. I was scared. The confusion that had clouded my mind was gone: all that remained was resounding fear. As abrupt as before, I felt myself being pushed and pulled, headfirst. He lowered his head after this comment. I was instantly in shock all I could think about was her family and how it was only a few days before Christmas. "they go fast, and young men loose their lives in strange and unimaginable ways" (Meinke 144). Two staggering steps toward her. Her throat is savaged, her tongue lulls and the kitchen air holds the unmistakable stench of death. There is a silver gleam of wire wrapped around her blood spattered neck. An empty kitchen-table chair stands next to her, as if she may have been sitting on it before she died. She sees the horizon for her husband is now broader, and this gives her scope to an ever grander possibility. She sighed deeply: "Once again he leaves me behind whilst he does everything. Its my past that we're attempting to piece together so I think I should be able to hear everything for myself. Right! That's it! I'm going to follow him whether he likes it or not!" The passing bells that he talks about are an old custom for when a person has died in the community. The slaughter of these young soldiers is so inhuman, that Owen likens it to the killing of cattle. Owen uses onomatopoeia for this poem by having "stuttering rifles rapid rattle" to continue with the slaughter of these men. Our team fumbled again and turned the ball back over to the gunners, resulting in an Arsenal goal. We all hung our heads as Arsenal celebrated their goal, and taunted our players. âWE SCORE WHEN WE WANT, WE SCORE WHEN WE WANT! He landed on a raised, hard surface. Cartilage and ribs snapped with the impact. Contrary to natural human reactions under the circumstance, he lay sprawled, arms at disjointed angles, completely helpless.